A three-day workshop on Regional Sharing of Experiences, Challenges, and Opportunities in promoting sustainable mountain development in the context of the upcoming Rio+20 conference concluded today at ICIMOD Headquarters in Kathmandu. The meeting brought together more than 40 experts from the Hindu Kush-Himalayan (HKH) countries (Afghanistan, Bangladesh, China, India, Myanmar, Nepal, and Pakistan) as well as from the Southeast Asian and Pacific countries (Indonesia, the Philippines, and Papua New Guinea) to share the progress made since the Rio Earth Summit in 1992 and deliberate on the environmental, economic, and social challenges that people living in fragile hilly and mountain ecosystems face in meeting the goals of sustainable development. Based on the 15 case studies presented and discussions conducted in various sessions, the workshop came up with key messages and recommendations that are expected to contribute to a Regional Assessment Report on the Challenges and Opportunities for Rio+20 in the HKH as well as the Asia Pacific Region. The report will be presented at a global conference on sustainable mountain development in Lucerne, Switzerland in October 2011. The Lucerne conference is expected to prepare a global report on the same theme to feed into the preparatory process for the Rio+20 conference to be held by the United Nations in June 2012. 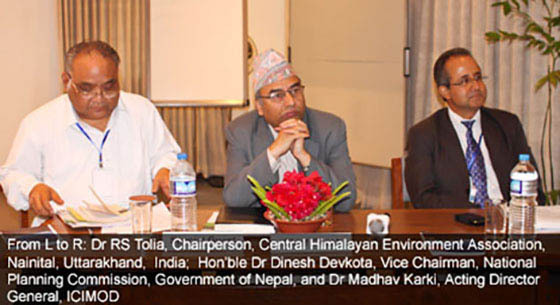 Dr Dinesh Devkota, Vice Chair of the National Planning Commission, Government of Nepal, in his inaugural speech emphasised the increased need for integration of environment and development issues in the mountain context and called for greater collaboration and synergy among different national, regional, and global initiatives. He noted that Nepal will lobby in favour of the global mountain agenda at Rio+20. Mr UK Sangma, Secretary of the North-East Council, Government of India, in his closing remarks highlighted the significance of the knowledge and learning gained in the workshop. Dr Madhav Karki, Acting Director General of ICIMOD, shared the major conclusions of the workshop which will be communicated to policy makers and stakeholders through various channels. Highlights include the following. The audience for the regional assessment should be not only global, but regional and national as well, since actions will be needed at all levels. The report should have concrete and actionable proposals for the mountains. Cross learning between countries and regions has generated new ideas, insights, and strategies for promoting sustainable mountain development which should be well reflected in drafting an inclusive and forward looking report. The two agenda items proposed for Rio+20 are somewhat top-down and unclear and therefore need contextualisation to match the mountain specificities. The report should have scope beyond Rio+20, for the policy changes and implementation work that has to follow.